[S208] Dorothy Dean Viets Schell, Viets, Page 61. Mary J. Barker was born on 30 March 1828. She was the daughter of Reuben Barker Jr. and Chloe Viets. Mary J. Barker married Hiram Johnson. Mary J. Barker married Dr. Charles N. Germaine. [S208] Dorothy Dean Viets Schell, Viets. Hiram Johnson married Mary J. Barker, daughter of Reuben Barker Jr. and Chloe Viets. Hiram Johnson died in 1852. Dr. Charles N. Germaine married Mary J. Barker, daughter of Reuben Barker Jr. and Chloe Viets. Dr. Charles N. Germaine died in 1882. Benjamin Franklin Barker was born say 1829. He was the son of Reuben Barker Jr. and Chloe Viets. Benjamin Franklin Barker died on 27 May 1856. Emma Jane Case was born on 16 March 1856 at West Granby, Granby, Hartford Co., CT. She was the daughter of Arlow Case and Lucy Jane Bacon. Emma Jane Case married Frank Pierce Hayes, son of Linus N. Hayes and Candace Eliza Viets, on 16 May 1875. Emma Jane Case died on 10 March 1936 at age 79. [S101] Ruth Cost Duncan, John Case, Page 134. Frank Pierce Hayes was born on 7 January 1852 at Granby, Hartford Co., CT. He was the son of Linus N. Hayes and Candace Eliza Viets. Frank Pierce Hayes married Emma Jane Case, daughter of Arlow Case and Lucy Jane Bacon, on 16 May 1875. Frank Pierce Hayes died on 14 May 1889 at age 37. Emma Birdena Hayes was born on 20 October 1877. She was the daughter of Frank Pierce Hayes and Emma Jane Case. Linus N. Hayes was born on 30 April 1821. He was the son of Dudley Hayes and Naomi Rose. Linus N. Hayes married Candace Eliza Viets, daughter of Festus Viets and Maria Hatheway. Linus N. Hayes died on 6 January 1886 at age 64. Candace Eliza Viets was born on 2 August 1828 at Copper Hill, East Granby, Hartford Co., CT. She was the daughter of Festus Viets and Maria Hatheway. Candace Eliza Viets married William Lorenzo Hayes, son of Dudley Hayes and Naomi Rose, on 20 April 1848. Candace Eliza Viets married Linus N. Hayes, son of Dudley Hayes and Naomi Rose. Candace Eliza Viets died on 5 June 1903 at age 74. [S208] Dorothy Dean Viets Schell, Viets, Page 75. [S498] Winfred R. Goddard, Granby Goddards, Page 69, Item 36511. William Lorenzo Hayes was born on 31 July 1825. He was the son of Dudley Hayes and Naomi Rose. William Lorenzo Hayes married Candace Eliza Viets, daughter of Festus Viets and Maria Hatheway, on 20 April 1848. William Lorenzo Hayes died on 28 March 1849 at age 23. Lorenzo Granger was born in 1822. He was the son of Chester Granger. Lorenzo Granger died in 1909. Delia U. Smith married Armenus E. Viets, son of Zopher Viets and Tracy Hillyer, on 16 December 1840 at Cherry Valley, OH.1 Delia U. Smith died on 8 January 1864 at Amboy, OH. [S208] Dorothy Dean Viets Schell, Viets, Page 99. Julia E. Viets was born on 26 August 1844 at OH. She was the daughter of Armenus E. Viets and Delia U. Smith. Julia E. Viets died on 5 July 1887 at age 42. [S208] Dorothy Dean Viets Schell, Viets, Page 172/Item 283. Amanda E. Viets was born on 22 February 1851 at Conneaut, Ashtabula Co., OH. She was the daughter of Armenus E. Viets and Delia U. Smith. Amanda E. Viets married Frank A. Rogers, son of Robert B. Rogers and Mariah Henlen Munger, on 5 November 1871. Amanda E. Viets died on 23 January 1931 at age 79. [S208] Dorothy Dean Viets Schell, Viets, Page 172/Item 284. Ada M. Viets was born on 28 August 1853 at Conneaut, Ashtabula Co., OH. She was the daughter of Armenus E. Viets and Delia U. Smith. Ada M. Viets married James A. Mills, son of John Mills and Sarah Rose, on 26 April 1877. [S208] Dorothy Dean Viets Schell, Viets, Page 172/Item 285. [S429] Donna Holcomb Larose, "Amasa Holcombe Jr.," e-mail to James H. Holcombe, 8 April 2003. [S25] Hannah McPherson, Holcombe Genealogy, Page 48.1, Item A-4-5-2-2-9-1-3. [S101] Ruth Cost Duncan, John Case, Page 148. [S418] Ruth Cost Duncan, John Case 2nd Edition, Page 143, Item 416. [S418] Ruth Cost Duncan, John Case 2nd Edition, Page 173. [S418] Ruth Cost Duncan, John Case 2nd Edition, Page 144. Henry A. and Laura S. were enumerated in the 1900 East Granby, Hartford Co., CT, federal census. He was 74, she was 64. Childlren in the household were Norwood 34, and Antoinette 31. Two servants were also enumerated. Henry A. Case, one of the prominent men of East Granby, died at his home in Spoonville Saturday afternoon, aged 78 years. He represented the town in the Legislature in 1869. He was the son of the late Zelah Case of Bloomfield and was twice married. 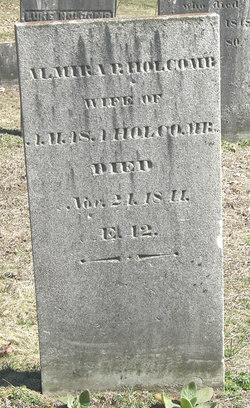 His first wife was elmira Holcomb and his second Laura Hopkins, who died three years ago. Mr. Case is survived by two brothers and two sisters, Charles Case, Edward Case and Mrs. W. W. Bartholomew of this city and Mrs. Goodwin of Northampton, Mass., and by two sons and two daughters, Mrs. Arthur Campbell and Antoinette M. Case of New York, and Harry W. and Norwood T. Case, both of East Granby. In addition there are two grandchildren, Harry and Marie Case. Mr. Case with his brother, owned and operated a grist mill near Tariffville for many years, and retired several years ago owing to failing eyesight. For the past few years his business interests have been attended to by his son, Harry W. Case. Mr. Case was a member of St. Andrew's Church in North Bloomfield, in which he took an active interest. His funeral will be held at his late residence tomorrow afternoon at 1:30 o'clock and at St. Andrew's Church at 2 o'clock. Burial will be in the family plot in the North Bloomfield Cemetery. [S418] Ruth Cost Duncan, John Case 2nd Edition, Page 102, Item 256. Sarah Fidelia Woodruff was born on 20 September 1844 at Akron, Summit Co., OH. She was the daughter of Nelson Woodruff and (?) Handy. Sarah Fidelia Woodruff married Albert H. Royal, son of William Royal and Emeline A. Viets, on 2 August 1866.1 Sarah Fidelia Woodruff died on 4 January 1922 at Shelby, MI, at age 77. [S208] Dorothy Dean Viets Schell, Viets, Page 100. Clinton Fitch was born in 1837 at NY. He was the son of Lyman Augustus Fitch and Caroline M. Roberts. Clinton Fitch married Martha Royal, daughter of William Royal and Emeline A. Viets, on 15 July 1860. Clinton Fitch died in 1900. [S244] John T. Fitch, James Fitch Volume One, Page 338. [S244] John T. Fitch, James Fitch Volume One, Page 337.